Here’s where Roanoke Regional Partnership Director of Talent Solutions Erin Burcham has been during the first part of the year, and what events are coming up. Contact Erin to learn how to get involved. Hollins University: “Why Roanoke after graduation?” program for 30 students interested in working and living here post-graduation. Virginia Tech Carilion: Promoted active lifestyle in Roanoke Region, including young professional events to 50+ medical and research students. Career Premier (Regional College Collaboration): Promoted internships and life after gradation in the Roanoke Region with 100+ students from six colleges. 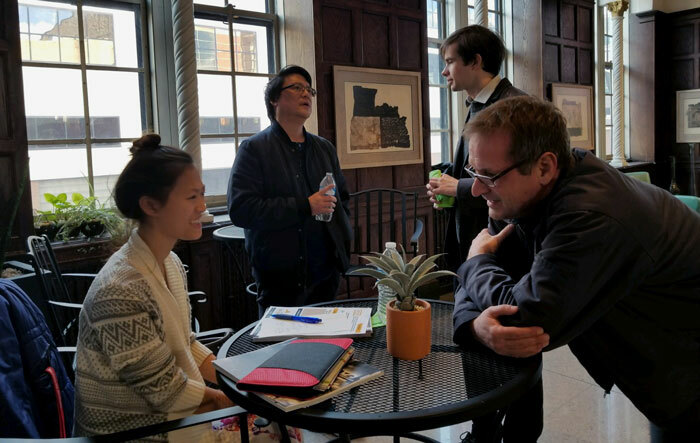 Virginia Tech Career Day and Design Expo 2019: Supported four Roanoke Region businesses who are recruiting architecture students. Hollins University: Coached and spoke to 30+ Hollins students during a one-on-one career coaching and speaking session with regional partners. Radford University Professional Communication and Etiquette Dinner: Led a group of 25+ students through a networking and dinner event. Connected multiple students to regional employers. Virginia Nurses Association Student Outreach Event: Promoted staying in the region after nursing school to 60+ students. AAF Career Connections: Partnered with AAF to promote Roanoke as a destination after school to 30+ advertising and marketing students from VCU, Radford, and Virginia Tech, as well as working young professionals. Roanoke College Internship Fair: Promoted internships and young professional programs in Roanoke and made 25+ direct connections between students and employers for internships. Host JMU Business and Engineering Students in Roanoke: Business visits to Delta Dental and AECOM with a walking tour of downtown for 20 James Madison University students. Virginia Tech Career Center Takeover: Take Roanoke Regional employers to Virginia Tech for a networking event with mini professional development sessions to recruit 100+ students for internships and jobs. Virginia Western Community College Spring Fling: Promote internships, companies, and jobs in the region. Virginia Association of Colleges and Employers: Connect with 100+ colleges throughout Virginia to advocate for the Roanoke Region as a great place to direct students for internships and jobs.